Canada House Wellness Group Inc (CSE: CHV) is a small cap cannabis stock that suffers from a horrible illness: it is relatively unknown. This vertically integrated entity is perhaps one of the few undervalued stocks in the current sector. While countless cannabis stocks were realizing unbelievable gains over the past several weeks, Canada House Wellness has been bumbling along. It realized very little, if any gains – its up a whopping $0.06 to $0.26 since the end of October. For these reasons and more, we’re performing our deep analysis on Canada House Wellness Group this week. Join us as we cover all aspects of this aspiring vertically integrated licensed producer that very few are aware even exists. Canada House Wellness began to take its current form on September 12, 2014, when it was announced that Saratoga Electronic Solutions had signed a letter of intent to acquire Abba Medix Corp. Prior to this, the company had existed in one form or another since the mid-2000’s. Primarily, the company was focused on prepaid calling cards as well as that of ATM’s. This changed after selling all assets and becoming a shell company, in search of finding a new sector to involve itself in. Enter, Abba Medix Corp. Abba itself began operations in 2013, when the founders saw opportunity in the new field of medical marijuana. By the end of 2013, it had filed an application to become an MMPR producer. In early 2014, it signed a lease on a facility with approximately 45,000 square feet, with the intent of turning it in to a grow facility. The facility was to be completed in stages. This acquisition still has ramifications for shareholders today. Under the terms of the agreement, 32,000,000 shares were issued to the founding shareholders of Abba Medix Corp. These shares are subject to a multi-year lock up. After the third year anniversary of the transaction date, 25% of the shares are unlocked and are able to be sold by insiders. 25% more are unlocked after year four. Finally, in year five the remaining 50% are unlocked, enabling insiders to sell their entire positions if they so wish. Canada House Wellness – The terms of the original Abba Medix reverse takeover deal. The reverse takeover was completed on March 13, 2015. Additionally, on this date the security began trading on the Canadian Securities Exchange, after delisting from the TSX Venture two days earlier. On May 6th, 2015, the company officially changed its name to Abba Medix Group Inc. Shortly after the reverse take over was completed, Abba Medix got to work with expanding operations. There was little hesitation involved. Less than a month later, the subsidiary of what would become Canada House Wellness signed a letter of intent. This LOI was with Redecan Pharm, a licensed producer and distributor under the Marihuana for Medical Purposes Regulations (MMPR). At the time, it was one of only seventeen licensed facilities. Under the terms of agreement, the sale price was approximately $11 million, with both cash and common stock considerations. A definitive agreement was signed on May 7th. The deal, as per the letter of intent, was signed for $11 million. Of this, $8 million was to be paid in cash, with the remaining $3 million being paid with 6,000,000 shares at a price of $0.50 each. 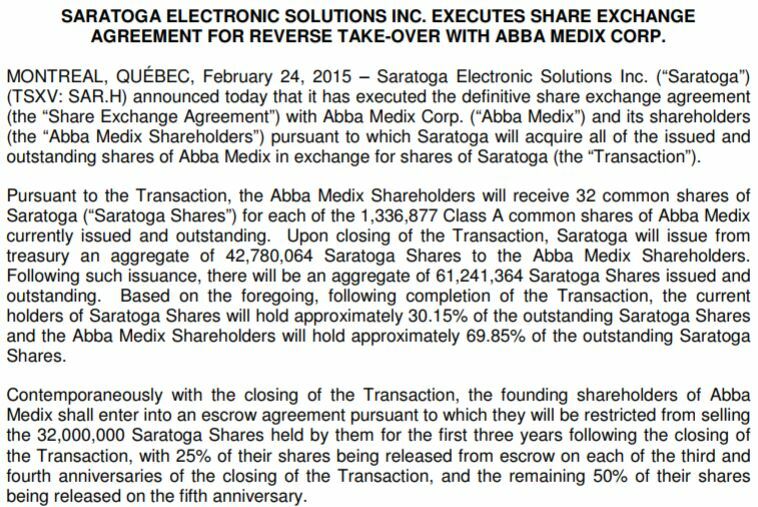 Unlike other agreements signed by Abba Medix, this deal was not subject to certain conditions being met for the access of the common stock. The agreement was to be finalized by August 7th, 2015. Not wishing to waste any time, a deal was signed on July 6th with GrowWise Health Limited. GrowWise, a company that assists patients in the MMPR system, agreed to use Redecan Pharm’s cannabis under the terms of the agreement. Although non-exclusive, Redecan would be the preferred supplier for GrowWise patients. On August 7th, 2015, the definitive agreement expired. On Oct 5th, 2015, it was announced that the companies had parted ways after not being able to come to an agreement. Barely two weeks later from the initial letter of intent to acquire Redecan, on April 20, 2015 additional expansion occurred. Abba Medix had signed a binding letter of memorandum to acquire Blow Canada Inc, as well as its US subsidiary, Blow Vapor Inc. 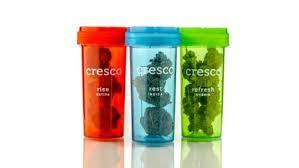 The company is involved in the manufacturing, sale, and distribution of vaporizer related products. The binding letter of memorandum was valid until July 31st, 2015. The total value of this deal was $5.5 million, both in cash and common stock. The details of this consist of $500,000 in cash consideration, and the issuance of 10,000,000 shares. 60% of the common stock is subject to escrow, and will be released upon certain conditions being met. Should the conditions not be met after four years, the shares would be cancelled. On July 31st, the deal lapsed. On October 5th, 2015, Abba Medix announced that the parties could not come to a mutual agreement, and walked away. After the announcement of the two failed acquisitions in October of 2015, the company went pretty quiet. A few news releases related to financing were issued, along with director changes. Aside from this, the company was hush-hush. This changed when on June 30, 2016, Abba Medix issued a news release. This release indicated that a definitive agreement had been signed with both Marijuana for Trauma, as well as The Longevity Project. The focus of both of these companies was a health benefit approach to that of medical cannabis. This was served to the public through a number of clinics spread across the country. Marijuana for Trauma itself was focused on the healing effects cannabis has for post traumatic stress disorder and chronic pain. Its founders are ex service members, who were in search of a pill-free way to deal with their PTSD. As such, their main focus is serving veterans to help them through their inner battles. The Longevity Project goes hand in hand with Marijuana for Trauma. This is due to their focus being the idea of “plants not pills”. They work across Canada to assist individuals in relieving themselves of prescription pills, in place of a more natural remedy for their ailments. In total, they have 12 wellness clinics, and approximately 9,500 clients. Under the terms of the agreement, both companies would become one. The idea is that they would work hand in hand in clinics across the country to support the growth of medical cannabis and cannibinoid therapy. Under this agreement, Abba Medix was much more generous than it had been with its previous business dealings. Likely afraid of losing yet another acquisition prospect, they were much more willing to give up common stock of the company. Under the agreement, Marijuana for Trauma would receive 51% of the current outstanding shares of Abba Medix. Likewise, The Longevity Project would receive 15% of shares outstanding, bringing the total to 66% of the company. In addition to this, there is approximately $4 million in cash involved in the acquisitions. The deal was expected to close by September 31, 2016. Also of note in the release outlining the definitive agreement, was a small bit at the bottom. It indicated that there would be a special meeting of shareholders. The reason for this, is the proposed consolidation of outstanding shares of the company, on a one share for every 1.5 share basis. On November 7, 2016 it was announced that the deal had been closed, and that the consolidation had been performed. In addition to this, Abba Medix Group changed its name to Canada House Wellness Group Inc. In conjunction with this, the ticker on the CSE was changed to CHV. After the formation of the new organization, Canada House Wellness became a company that one day will become fully vertically integrated. This cycle would start at the bottom, with the Abba Medix facility that was currently in the review stage of its application to become a licensed producer. This facility would grow and produce the medical cannabis. Next, this cannabis would be sold to its clients through the Marijuana for Trauma clinics that are in the process of being established. With these locations being located across the map, Canada House Wellness would have a dedicated sales line for the cannabis in which it produces. The only issue with this vertical integration, is that Abba Medix is not a licensed producer. To resolve this, on January 10, 2017, the company signed with a licensed producer. Under the terms of this agreement, Canada House Wellness would be supplied by the licensed producer, with the cannabis having the label of Canada House Wellness. This would then be shipped to the companies clients across the country. On April 10, 2017 Canada House Wellness announced that it had acquired Knalysis Technologies. Knalysis is a technological company that is involved in creating software related to cannabis. Its portfolio includes a health tracker app designed to assist users with finding a strain of cannabis to resolve their ailments, an analytics portal which stores all the information related to its app which is invaluable data to producers, dispensaries, pharmacies, etc, and a patient tracking program for use in the cannabis industry. Undoubtedly, Knalysis is focused specifically on the medical cannabis and the health benefits it provides to patients. Under the terms of the agreement, 100% of Knalysis Technologies was acquired. This was in exchange for five million shares of Canada House Wellness, in an all stock transaction. As it stands today, Canada House Wellness is on the cusp of becoming a fully integrated organization. On September 1st, 2017 Health Canada granted Abba Medix a license for cultivation of cannabis. Upon receiving its sales license, the company will be able to fully serve its customers end to end, from Abba Medix, all the way through to Marijuana for Trauma. It is still heavily focused on serving veterans and their need for medical cannabis and related products. As per the latest corporate update, that customer base sits at approximately 7,000 customers. These customers are served through eleven wellness clinics established across Central Canada. Additionally, through the technology provided by Knalysis Technologies, the company is able to guarantee a 24-72 hour prescription and renewal fill time throughout its client base in Ontario. As seen above, Marijuana for Trauma is currently heavily focused on Central and Eastern Canada. Aside from its Edmonton location, there is virtually no presence in Western Canada. However, this is appropriate. 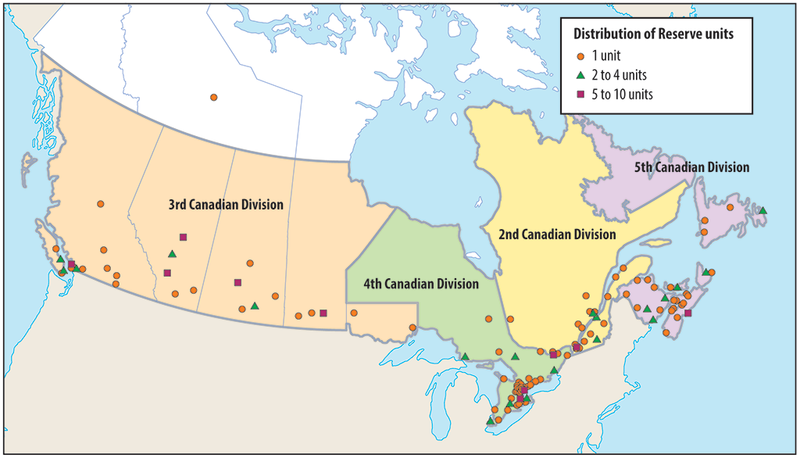 This map largely mirrors that of the map below, which demonstrates the distribution of Canadian Forces reserve units. With Canada House Wellness and more specifically, Marijuana for Trauma having such a large focus on the niche category of veterans, this is where the majority are likely to be located. As can be seen by this map, the current locations are appropriate. Furthermore, we can likely extrapolate where future locations will be for Marijuana for Trauma. With its current locations, the subsidiary is currently capturing the largest percentage of its niche with the fewest amount of clinics. In addition to its three subsidiaries, Canada House Wellness Group is looking to expand its operations. To do so, it was recently announced that a letter of intent had been signed by its subsidiary, Abba Medix Group. The letter of intent outlines a potential agreement between the subsidiary and that of Nutritional High (CSE: EAT) to form a joint venture. The purpose of the joint venture is to manufacture cannabis infused products, in addition to that of cannabis oils. Under the terms of the agreement, the joint venture would reside at Abba’s facility. It would consist of approximately 2,000 square feet of currently unused space at the location. The goods manufactured would then be sold to Canada House Wellness’ clients, as well as to international markets. In addition to this, a portion of the goods would be sold in the future to recreational users, as Canadian legislation permits. Furthermore, all funding costs related to the joint venture are to be born by Nutritional High. Costs related to the establishment of the oils extraction facility will be returned to Nutritional High as revenues permit, on a priority basis. The profits from the venture will be split on a 50-50 ratio. Finally, in company MD&A documents posted October 30, it states that this joint venture has been signed. No news release as of yet indicates this. As some investors may or may not be aware, Canada House Wellness Group has had a recent issue with filing its latest financials. As the result of a legal proceeding with a former director and board member of the company, the annual financial statements for the period ending April 30, 2017 were significantly delayed. In fact, these documents were not released until October 30th. This in turn delayed the financials for the quarter ended July 30, 2017. These documents are expected to be out sometime between Monday and Wednesday of this week. As a result of this, we’ll be sure to cover them upon their release. For now, bare with us as we work with what we have been provided. Canada House Wellness MD&A excerpt from page 9. As seen above, the synergies expected between Marijuana for Trauma and The Longevity Project were not realized. Due to this, the company has wrote off the value of the acquisition in their 2017 financial statements. This leaves many questions for investors – why were they not realized? What, in its entirety was expected for synergies? If both companies were consolidated in to one, as previously indicated, is it being effective if the synergies were not realized? Canada House Wellness statement of loss for the 2016 – 2017 fiscal year. Just take a minute to run through those numbers. Look closely at them. On $6,000,000 in revenues, the company registered $20,000,000 in expenses. Lets break it down a bit though. $9 million worth of that total is related to transaction to acquire Marijuana for Trauma and The Longevity Project. Additionally, $1.9 million is the result of impairment – $1.2 million of which is that of The Longevity Project. However, even when you do some rough math, and cut out that total of $11 million which will not be recurring expenses, you’re left with $9 million. Approximately $4 million of this is related to employee compensation. This is not sustainable in the long term. Canada House Wellness needs to severely cut down on its expenses. Professional fees would be an excellent place to start. However, we also need to remember that Abba Medix, although it can now cultivate cannabis, it still cannot sell it. As a result of this, salaries and wages will be disproportionate to that of when it achieves its sales license. When analyzing the financials of a company in the growth stage, as investors, we need to be reasonable. Its unlikely that they will have more assets than liabilities. Its unlikely that they will be profitable. However, there are always signs of money being wasted. Items such as stock based compensation are a good place to start. Compensation in the form of common shares should be reasonable with respect to the profitability and performance of the company itself. The exception of course, is when executives are paid only in stock. 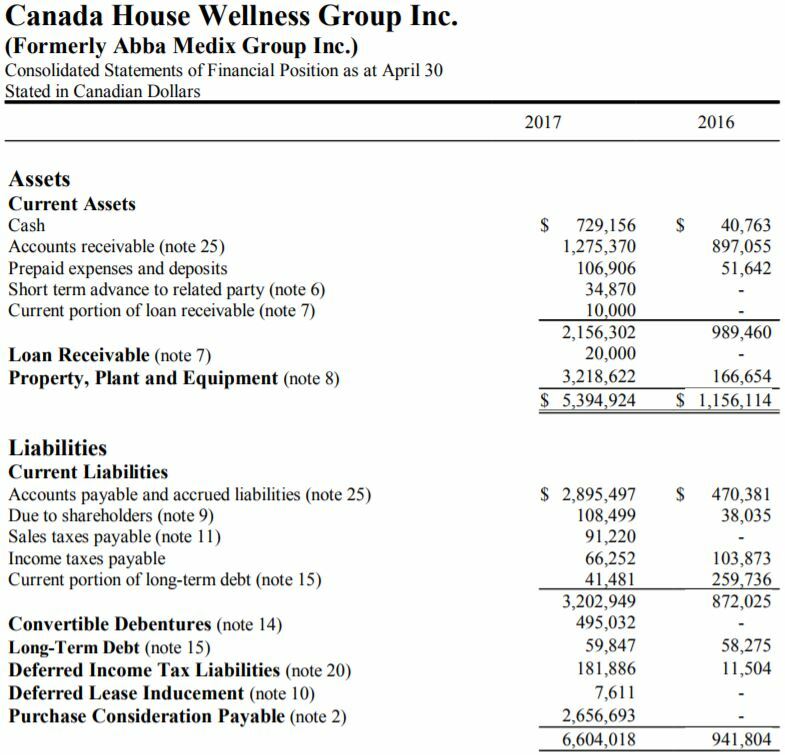 Canada House Wellness’ balance sheet as of April 30, 2017. Again, as stated previously, we acknowledge that this is a company in its growth stage. As such, the balance sheet shouldn’t be expected to be spotless. However, that doesn’t change the fact that there are close to $3 million worth of current payables due in the next 12 months. Due to the delay in issuing the report, that time frame now has six months remaining. In the subsequent events section of the financials, it does note that $422,177 of the accounts payable was settled through mostly shares. However, that still leaves a large deficit when compared to the cash and accounts receivable position of the company. Lastly, is the difference of $1.2 million that needs to be addressed. For the size of this company, that is a significant gap between the value of all assets and that of all liabilities. The share structure, as it stands, is slightly complicated to define. This is due to a convertible debenture that was performed. The value of the debentures warrants in relation to that of stock has a range dependent on when they are exercised, as outlined below. Canada House Wellness debenture specifications. 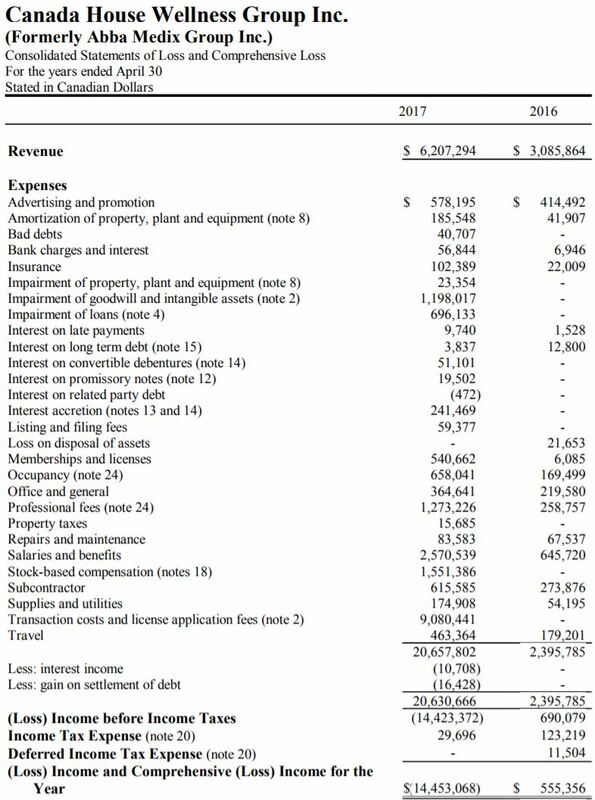 As a result of the format of this convertible debenture, it has been noted on the calculation below, and should be factored in to your investment plan. For the following table, all figures were sourced from the MD&A released on October 30, 2017. It was accurate as of October 29. Canada House Wellness’ share structure, as of November 18, 2017. On a fully diluted basis, as of November 18, 2017, Canada House Wellness has 168.4 million fully diluted shares. As previously addressed, the convertible debenture warrant has a varied exercise price, denoted by the asterisk. Also of note, is that on November 6, 2017, it was announced that there would be another convertible debenture offering. The total value is expected to be between $2 million and $4 million. The conversion price for this offering ranges from $0.19, to $0.40 for the common share. Each full warrant will have a range of $0.30 through to $0.80. Each debenture unit of $1,000 will be associated with 5,263 shares, and the same number of purchase warrants. This will in turn largely affect the current share structure, adding up to 42.1 million more shares to the share structure. Mr. L Bortles is a highly educated member of the Board. His education consists of an MBA from Harvard, and a BA from Cornell. As per his LinkedIn profile, he has served as a director a number of times previous to serving for Canada house Wellness. In addition to this, he his presently a director at MMJ Enterprises, an applicant to be a licensed producer based out of Edmonton, Alberta. Riley McGee currently serves as the president of Marijuana for Trauma in addition to serving as a director. Having been a member of the Canadian Armed Forces for a number of years, he’s able to draw on his experiences to assist those who are in need of help. This in turn, makes his current role an excellent fit, with the subsidiary being focused on the niche market of serving veterans and first responders. In addition to this, McGee along with Bortles owns MMJ Enterprises. As a result of Canada House Wellness’ history of acquiring companies owned by directors, it is likely that at some point this will come under the domain of the company as well upon licensing. A co-founder of Marijuana for Trauma, Mr. Southwell currently holds approximately 21 million shares of the company. He currently serves as a director. In terms of experience, he brings to the table previous history of working with licensed producers under arrangement. Previous to being acquired by Abba Medix / Canada House Wellness, Mr. Southwell had arranged an agreement between Organigram Holdings and Marijuana for Trauma related to the use of their clinics. Nicole Ferris joined the Canada House Wellness team when Marijuana for Trauma was acquired by the company. From the information that is available, she served as Chief Operating Officer for the company. Now, she also serves as a director for Canada House Wellness. In addition to being the COO, she has experience on the IT side of things, primarily with Cisco related systems. With vast experience related to cannabis, Scott Purdy is a director for the company. He has a history of working in the health care industry, and most recently ran a consulting and investment firm for the use of cannabis. He is a licensed cannabis grower under the MMAR regulations. Mr. Methot comes to Canada House Wellness as a result of the acquisition of Knalysis Technologies. Currently serving as the CEO of Knalysis, Paul Methot has many years of experience in software programming. In addition to serving as CEO for Knalysis, Paul also serves as CEO for Pragmatic Informatics, another software company that has a much broader focus. Mr. Appleby has been serving as a director to Canada House Wellness for a very short time – he was appointed on October 26. By trade, he is a lawyer whom is licensed to practice in both Ontario and New York. His focus in law is that of corporate law, specifically how it relates to mergers and acquisitions, along with agreements. As a result of this appointment, it may be a sign that Canada House Wellness is continuing to expand its footprint in the marketplace through the process of acquisitions. Otherwise, there would be little need for a director with such credentials to join the board at this point in time. Recently on October 26, Dr. Van Vurren was appointed one of the newest directors of Canada House Wellness. He has been a doctor for approximately three decades, and has experience in many of the related fields. He is an advocate for the use of medical marijuana after seeing the results it delivers, and as such has been associated with Marijuana for Trauma for a couple of years now. Canada House Wellness Group is perhaps one of the most inexpensive licensed producers on the market right now. With a market capitalization of approximately $31 million, it’s definitely priced lower than that of many of its peers. However, that being said, it also has some notable issues with its balance sheet. There’s also the issue of the company being relatively unknown, despite spending over half a million on marketing in the last year. When it comes to it’s vertically integrated business plan, its tough to beat. There are few licensed producers currently that are vertically integrated. Furthermore, it just is not in the business plan of the majority of players. This in turn results in the company having a competitive advantage, so long as they act on this golden goose upon receiving a license to sell cannabis. Mixed in with the growth the company has seen for patient sign ups at its Marijuana for Trauma clinics, and this truly could be a winning equation. The company is not without its issues however. It has a poor history of closing transactions, which is unfortunate. Had the Redecan Pharm deal been signed, the company would be in a totally different financial position currently. There’s also the issue of two clinics that seem to have “disappeared” – one in Winnipeg and the other in St. Jean, QC. This may be related to the management cease trade order that was filed, and that of the delayed April and July financials. Furthermore, if more acquisitions occur as we suspect they might, the dilution and share structure of the company will take a nose dive. It’s in a bit of a “sweet spot” right now with regards to its fully diluted shares. However, with the latest debenture, it is likely that it will begin to be too diluted for price movement to occur at a quick pace. Thus, the acquisitions going forward need to be fully planned out, and the benefit to the company clearly defined. Otherwise, Canada House Wellness may end up with another acquisition that pans out like The Longevity Project. Aside from these points, Canada House Wellness appears to be on the right path. At the end of the day, its a company in its growth stage and all indicators prove this to those who take a hard look at the company. Yes, it’s had a few missteps along the way, but this is natural for a young company in a new industry. In an industry that will quickly become dominated by giants, organizations need to move quick if they don’t wish to be swallowed up by a bigger competitor. This can lead to a misstep or two amid the rush. Just remember, sometimes it’s the quiet guy in the back of the room that has the best solution to the problem at hand. Read the reports. Analyze the situation. Dive deep. Information for this analysis was found via Sedar, Canadian Insider, LinkedIn, Bloomberg, Canada House Wellness, Marijuana for Trauma, and the Office of the Governor General. The author has no securities or affiliations related to this organization. Not a recommendation to buy or sell. Always do additional research and consult a professional before purchasing a security.